In our busy lives, where we constantly juggle family life and work commitments, some days the closest that I get to what some people would describe as ‘real adventure’ is gazing in awe at the lives of others on social media. We don’t do badly, of course, but the vast majority of our adventures – and we’re genuinely really happy about this – are short, local activities that we can access almost instantly, year round, with no long-winded preparation. These give us the opportunity to get some fresh air, get some exercise and disconnect, just fleetingly, from life’s pressures as a family. As well as throwing up the issue of ‘well, what is adventure anyway?’ it has also led me to consider whether social media and adventure are complimentary and harmonistic bed partners; there to inspire us to get outside. Or, is social media and adventure, as a combination, a pair of whispering devils promoting the often out of reach adventures of a privileged minority, to ordinary people left dragging their self-esteem around on the floor and putting themselves at risk in their desperate attempts to keep up with the Joneses? So, how did my brain recently become consumed by the links between social media and adventure? Well, since I’ve returned to work following the Christmas break, I’ve started teaching a unit of non-fiction writing to a couple of my classes. By sheer coincidence, when I was scouring around for style models to share with the kids, I came across an article written by Grace Dent and published in the Independent newspaper back in 2013. In the article, Dent, with oodles of biting wit and sarcasm, muses modern society’s obsession with selfies – you know…the practice of shamelessly and egotistically pouting into your phone regardless of situation or environment. It doesn’t seem to matter whether we’re in public toilets or on mountain tops, because…well, you know…#YOLO, right? The article, while very funny and deliberately offering little in the way of answers, got me thinking more widely about images on social media. More specifically, it got me to thinking about what WE post on our social media and what sort of messages we send out to people. Frankly, for me, posting images of our family adventures, or of our husband and wife date night hikes, or of my escapades with friends is something that was always intended to be a positive thing. Yes, I fully understand the importance of ‘being in the moment’ while we’re outdoors. And yes, I realise that we snap photos while we walk, scramble, camp and paddle, but they carry very little importance to us compared to our primary goal of being out there to enjoy each other’s company and our surroundings. We may stop for the odd family selfie or occasionally, if we’re exploring a new area or route, get the tripod out of the backpack to setup a ‘posed for’ family shot. However, we do this because how the hell else would we get a photo of all four of us when we’re in the middle of nowhere with no bystanders to ask? In fact, I’m so lackadaisical, I’ve been known on more than one occasion to forget the memory card for our GoPro, meaning we can’t shoot any video when we’re out and about. That, surely, isn’t the sign of somebody preoccupied by image rather than experience. Our social media and adventure photos are, more often than not, an afterthought. We like to snap the kids when they’re not looking to capture their genuine sense of playfulness and fun outdoors. I’m certainly not about to plan a trip to a remote road somewhere simply because I’ve seen ‘cool’ people posting pics of themselves staring down #lifesroad on Instagram, while all the time putting themselves in direct danger of an articulated lorry ploughing straight through them. That’s not our style and I honestly tend to scroll past photos like that because…well, who in their right mind does that naturally? I want our social media and photos to be a fair and honest reflection of us, not some #fakenews version of ourselves intended to make us look like some sort of Stan Lee designed outdoor superheroes. In this sense, of course, the likes of Instagram (which currently takes the gong for my personal favourite form of social media) can be incredibly disingenuous and incredibly off-putting to lot a people. As part of the work I’m doing in school with my classes we’ve found out that Instagram is the social media format with the highest levels of unhappiness amongst its users. The claim is that its overwhelmingly positive slant towards perfect lives, lifestyles and adventures are so ‘perfect’ that they are demoralising and depressing vast swathes of society. To test this, in 2017, the Royal Society for Public Health (RSPH) conducted some research among 17 – 24 year olds which asked them to rank how each of the big five social media platforms made them feel about everything from the effects on their sleep and body image to FOMO, or fear of missing out. Instagram ranked the worst of the lot. It is pretty clear, therefore, that people continually gazing at staged photos, which overwhelmingly create the perception of a ‘perfect’ scenario, relationship or family can be incredibly damaging. This again made me reflect on our social media and adventure photos. As I’ve already pointed out, we post a mixture of candid, action shots, and, admittedly, a few posed photos on our Instagram feed. But, are we doing enough to curate them in a responsible manner without our followers feeling that everything we do is out of reach or some sickly-sweet representation of family life? In all fairness, although I genuinely hope that we are being responsible, we are perhaps not the people to judge are own impact. As such, honestly, tell us, because if there is a disconnect between what we’re posting and what your impressions of that are, we need to know about it. Seriously. Despite the many and obvious negatives, I am still a great advocate of the relationship between social media and adventure. Managed responsibly, it can serve as a gateway to ideas, activities and the sharing of experiences. 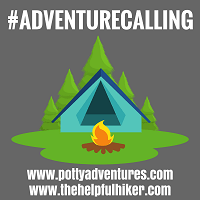 I have looked into new walking routes and camping spots because they have been brought to my attention on the likes of Instagram. I am now more aware than ever of our negative environmental impact on the outdoors thanks to people who share important issues and information about plastic pollution and the like on social media. The connections that I’ve made with people are real and tangible, despite having not met the vast majority of people I follow. I’m not the greatest runner but I’m enthusiastic all the same. So, I follow trail runners who inspire me to tackle more hills, go out when the weather is grim and give me tips on how to manage injuries. All that means that last year, and in spite of a lengthy injury layoff, I ran further in a single run and ran more miles over the course of the year than ever before. I follow walkers and mountaineers from all over the UK so that I am able to experience the beauty of what our small but beautiful island has to offer. This leads us to take weekends and holidays away on our own shores to explore these regions that aren’t immediately on our doorstep. 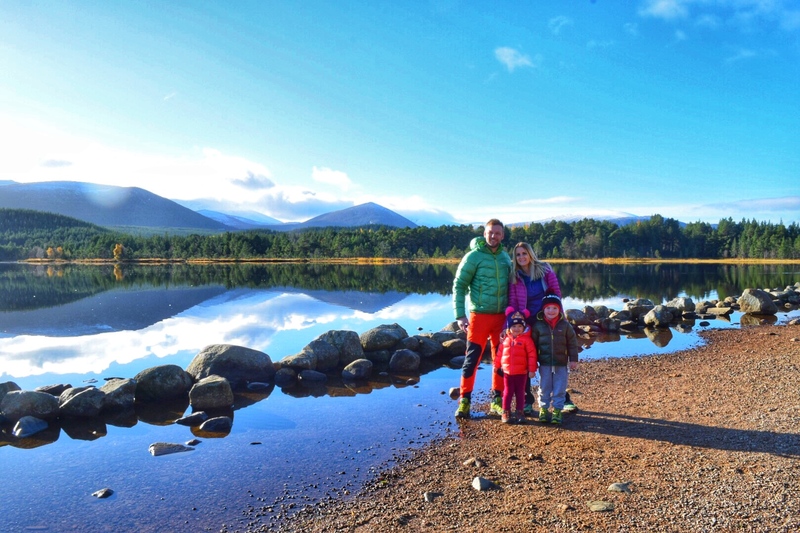 In fact, after being inspired by several accounts that I follow that are largely based in Scotland, we had one of the best weeks we’ve ever had as a family last October during our stay in the Highlands. I also follow some amazing accounts from around the world that are, at least in part, responsible for me now having destinations like Utah and Alaska on my travel bucket list. Following other outdoor family accounts to see how other parents manage young kids in the great outdoors is also a great way for us reflect on how we do things and the types of activities that we expose our kids to. Rather than being made to feel inferior by any of these accounts, we’ve felt incredibly supported when people simply comment with things like “chin up, our kids did the same last week”. It’s clear that, rather than feeling isolated, we feel part of a community. A positive community built on reality, understanding and an overriding sense of adventure. Of course, that paradox between getting outside to escape the trappings of modern life, but then using gadgets to capture, contextualise and share it isn’t lost on me. Furthermore, I fully realise that there are influential Instagram accounts out there who stage their entire lives in their quest for digital adulation. We have to remember, however, that nobody forces us to follow such accounts. That “unfollow” button is pretty easy to find should you find your life being negatively impacted by the deception of others. Choose who you follow carefully and, hopefully, you’ll begin to reap the rewards of your very own social media and adventure community. ‘But where are these genuine people lurking?’ you scream. Well, start by searching for outdoor-related hashtags, or check out who people that you respect and who inspire you follow. Also check out the hashtags that they use so you can find more like-minded accounts. Instagram is a bit like life. There are lots of idiots and perfect (fake) portrayals of life out there, but search hard enough, be discerning and you’ll establish connections that you cherish. Personally I think if you’re usuing social media to promote your own blog, posts should be aligned with your blog with a few tidbits of personal life added in. But I think you’re spot on with your own because your blog is already about family travel and adventure. Comprehensive and good points raised. Social Media is necessary, but me for personally I am trying to limit my use and focus more on building around my website and content produced, as opposed to forcing exposure through Social Media. I have a big issue with Social Media misuse. I know plenty of people who have worked with brands etc, but continue to create a Social Media audience that isn’t real. Sad times and scary the lengths people will go to. Social media and who you follow is a bit like watching TV. I would rather watch a wildlife programme than Love Island and like you that reflects in who I follow on social media. I also tend not to follow feeds that are largely selfies as they don’t interest me. It’s all about the choices people make. I do think the more social media is talked about and the issues around it the better, so hopefully the current generation of young users will take it less literally and have a more realistic view of what is being portrayed. A thought-provoking post, for sure! I still struggle with the whole social media game and how we should be switched on all the time to keep up. I also find it hard in terms for privacy for my kids. With this in mind, I use Instagram and Facebook (mostly) to share the photos I’m most proud of and to promote my blog posts, always hoping to inspire other families to get outdoors. Never liked selfies, although we’re doing more family selfies these days because they’re fun. Keep doing what you’re doing. Personally, I see no disconnect between your social media image and what I imagine your real life to be. Really thoughtful post and I also have these FOMO battles with social media. I actually don’t much like it but know I have to do it if I want to grow my blog so people find me. So instead I use instagram as a way of bettering my photography skills and look at it as an album for myself and family. Something for me to look back on and see what cool stuff I’ve done. I think having a blog attached to social media is also a great way to add another dimension too, and for people to read about the stories behind the photo. Like you I follow some incredible people on instagram, and do often get a bit despondent about not being able to do those things right now. But then, I remember to practice gratitude and cherish what’s going on now in my life, with two little people, and be pleased I’m doing my best to get out and enjoy our amazing world in small ways with them. Anyway, without social media, I wouldn’t have found this like-minded community would I?! Brilliantly written, with many very valid points, arguments and thoughts, thank you! I actually find instagram is the platform which I get the most positive feelings and often (as I perceive it) genuine and honest interaction from. But it could perhaps just be that I’ve always loved picture-based communication? Though I think there’s more to it than that. As I was reading your post, I was thinking that it’s very much about finding ‘your people’ on there, and you then went onto saying the same thing here 🙂 I’ve recently become more likely to unfollow if I see things in my feed that doesn’t contribute to it being what I’m hoping for. I know that most of the people I follow are interesting to me in one way or another, but when I first went on IG I would pretty much follow back anyone who followed me, and many of them did so just to get the follow back (and have since unfollowed me). So I’m kind of cleaning up my feed by clearing out the ones that I never have any interaction with anyway. And I’m not so inclined to follow anyone who’s grid is looking too perfect, too planned. I’m not on there to see pink flowers against pink backgrounds, or pics of someones desk with “inspirational quotes” on a sign, etc.